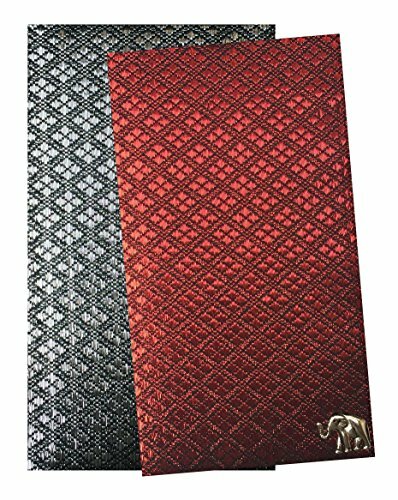 100% Handmade set 2 of Thai fabric with elephant pewter guest check presenter, check holder for restaurant, waitstaff organizer, restaurant server book. The perfect finishing touch to your customers dining experience in red and silver . Guest check book holder is double panel size 5"W x 8.5"H with plastic cover. Beautiful, unique and cannot find in other shop. The checkbook cover / holder are meant to be functional, durable and stylish. Guest check presenter for restaurant come with 3 slots to organize checks, credit cards and change. View More In Food Service Equipment & Supplies. If you have any questions about this product by Kathy, contact us by completing and submitting the form below. If you are looking for a specif part number, please include it with your message. Handmade Blue Thai Fabric Check Presenter Check Book Holder for Restaurant,Check Register for Hotel, Waitstaff Organizer, Waitress Server Book with Money Pocket, Check Pad Holder, Waiters Wallet. Blue & Gold Thai Fabric Guest Check Presenter for Restaurant, Check Book Holder, Waitstaff Organizer, Server Book for Waiters, Credit Card Holder, Waiters Pad. © 2019 - thaicitydeals.com. All Rights Reserved.